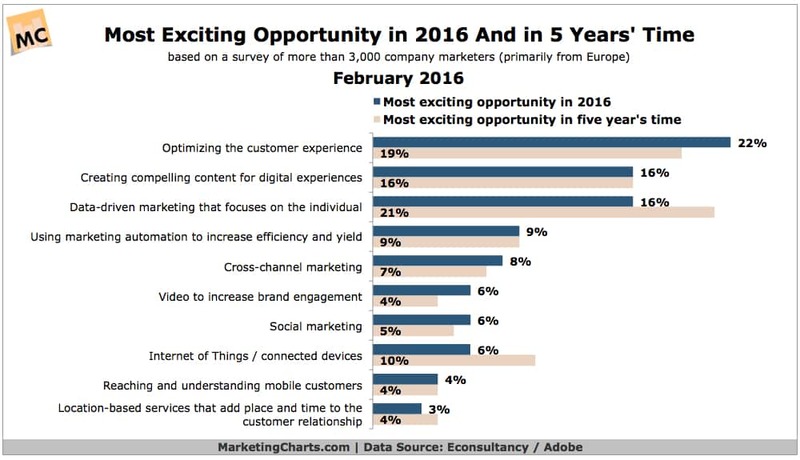 Where Do Marketers See Their Most Exciting Digital Opportunities Today And in 5 Years? Econsultancy and Adobe study – and specifically the topic of customer experience – the results indicate that company marketers will place their greatest emphasis this year on: Making the experience as personalized and relevant as possible (25% share); Making the experience as valuable as possible (25%); Making the experience as easy to understand as possible (17%); and Making the experience as safe and reliable as possible (11%). 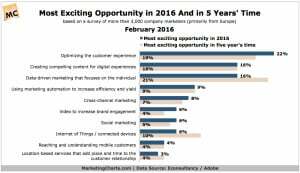 Source: Where Do Marketers See Their Most Exciting Digital Opportunities Today And in 5 Years? E-Commerce Site Built in 2 weeks !